I normally hate press releases. They usually build up an artist with preposterous claims of genius, labelling previous albums as “critically acclaimed” and the item in your hand as “eagerly anticipated”. This sort of guff does my napper in with its assumption that the reader is a moron. By contrast, the twisted but hilarious PR for ‘…Love You’ by The Loves delivers no such nonsense, calling front man Simon a “singing idiot” and describing his vocals as “caterwauling”. That tells you all you need to know about how seriously they take this industry and why some of us have loved them for so long. 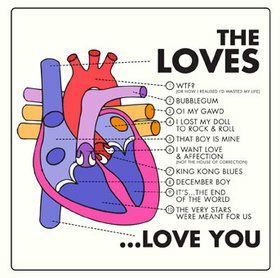 The Loves 2000-2010. I’ll miss you.